Gifting relatives with red envelopes of cash, or hongbao, is one of the oldest traditions of Chinese New Year. When China celebrates the Lunar New Year, millions of red envelopes change hands. But this year, the gift-giving is happening on smartphones. Last week, we discussed Weibo and Alipay’s red envelope giveaway in conjunction with the Spring Festival Gala. In the digital age, this centuries-old practice has gone virtual—how did Tencent’s popular WeChat app turn this custom into a wildly popular digital phenomenon? In 2014, Tencent launched a new feature that allows individuals to send electronic envelopes of money. This year, the practice has become immensely popular and gone viral. 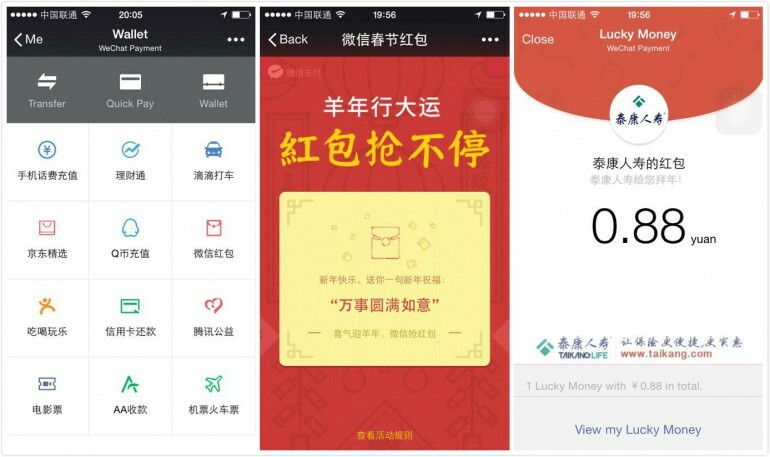 Users who want to gift WeChat envelopes have to first connect a bank account to their WeChat wallet, then add money to a digital red envelope. Then they can send friends a link to the virtual hongbao or post it in group chats. Those who click the link can receive the cash—of course, if the recipient wants to deposit the money, their bank account has to be linked to their WeChat wallet as well. For specifics on how you can advertise on WeChat, download our WeChat Advertising Guide and check out or blog post on “Why Brand Should Care about WeChat advertising“. Red Envelope Lucky Draw: You can assign a lump sum to a group red envelope, and the number of small red envelopes within it. After posting to a group chat, WeChat will randomly assign the amount in each envelope to each recipient. Adding an element of gambling-like suspense, it has become a trending activity on WeChat this year. 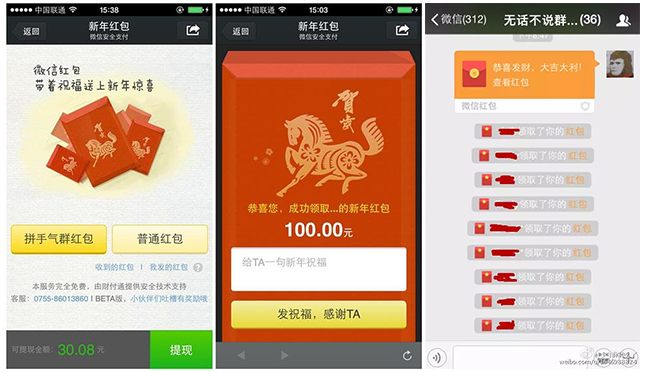 On the eve of the Lunar New Year, over one billion WeChat red envelopes exchanged hands digitally. At the peak of this activity, 550,000 envelopes were sent, and 1,650,000 were opened per minute. Similar to how Weibo and Alipay partnered with the Spring Festival Gala, WeChat also took advantage of the most-watched event of the year, and introduced their own spin on a giveaway—the WeChat Red Envelope Shake. The game utilizes WeChat’s “shake” feature. 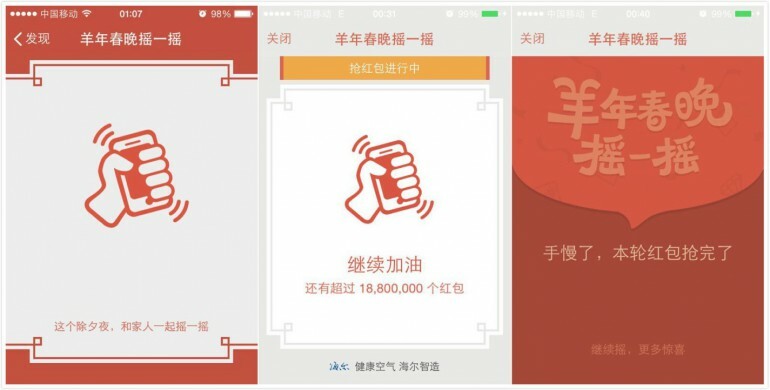 During the Gala, users simply have to shake their smartphone for a chance to win red envelopes. A total of 1.2 billion red envelopes worth over half a billion RMB ($83 million USD) were sent out during the program. The red envelopes were sponsored by various brands, and consisted of cash and coupons—creating a great advertising opportunity. The biggest prize was a WeChat red envelope worth ¥4,999 ($830 USD). With this year’s Spring Festival Gala broadcast live on YouTube, users from 185 countries all over the world participated in this event. During the peak of activity, there were 800 million shakes per minute! The WeChat red envelope campaign was a great success. Not only was it a creative idea, it changed traditional Chinese New Year greetings amongst friends and family, and created great advertising exposure for sponsored brands. Moreover, the viral effect also helped WeChat successfully tap into the digital wallets of millions. What distinguished WeChat’s campaign from Weibo and Alipay’s joint effort was that WeChat created an even better user experience with easy and enjoyable ways to participate. The element of gambling added an extra thrill, too. WeChat has hundreds of millions of users texting friends every day; once those users connect their bank account to the app, they’ve essentially opened their wallets to Tencent. Both WeChat and Weibo’s red envelope campaigns had a lot of success. It’s interesting to see how they competed during the Chinese New Year. Competition will foster innovation and ideas—we can’t wait to see what next year will bring!